Studies conducted by the Center for Dental Informatics (CDI) at the University of Pittsburgh have shown that dental software today is poorly designed for supporting clinical care (1, 2, 3). Many of these applications were designed with only billing and administrative functions in mind, adding clinical support only as an afterthought. As a result, clinical functions tend to be poorly integrated, and most applications suffer from including too broad a range of functions. Worse still, many electronic charts are just digitized versions of paper charts, indicating there is clear room for innovation. 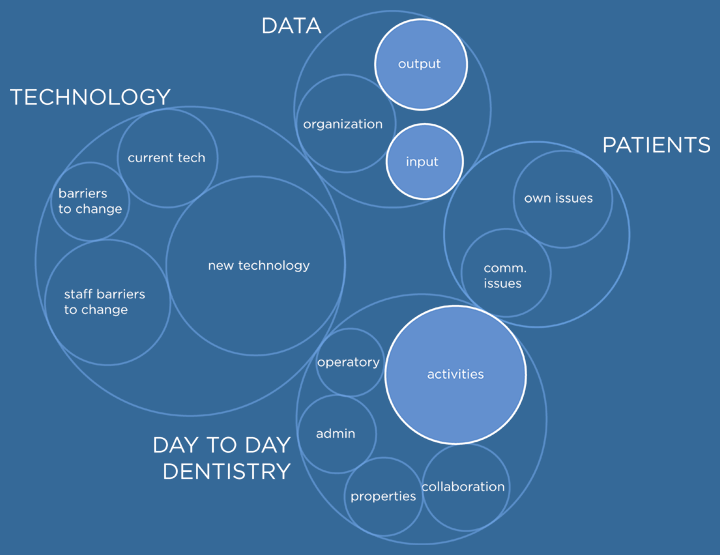 Our goal was to innovate and change the way computers are used in a clinical dental setting. The world of dentistry is fairly broad, and the time and resource placed on this project are limited, suggesting that solving specific problems may be more worthwhile than the kitchen sink approach taken by vendors today. To narrow down our scope, we did something we call focus setting. 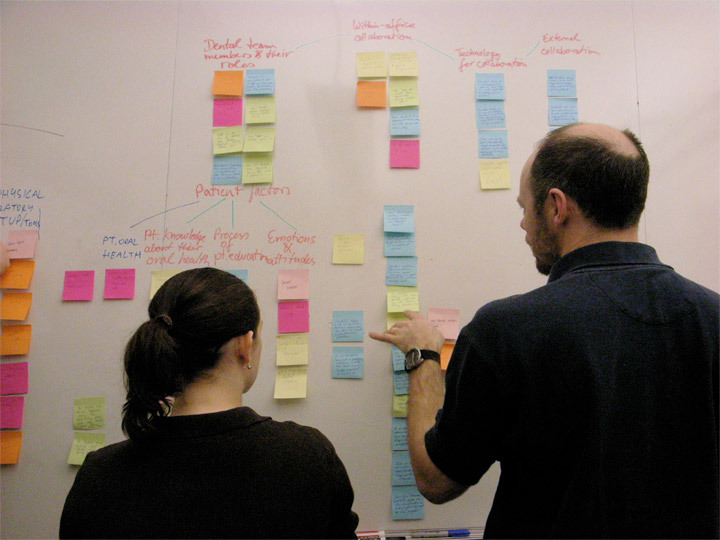 All of our potential ideas were written down on post-it notes and organized into small groups. From these groups we selected key areas of interest. We consolidated our findings across three levels of hierarchy. 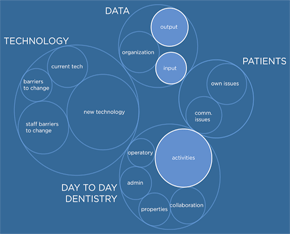 In the end, four high-level themes emerged: technology, patients, data, and day-to- day dentistry. Among these, data input and output were of most interest to our project client. These areas are of important understanding and improving the patient care process. We especially wanted to see this data recording and reviewing within the context of actual dental activities. An additional sub-focus we identified, and not highlighted on the chart, was to understand the barriers in changing from a paper- based office to an electronic based one. This focus served us well during our contextual inquires (CIs), but proved too broad for additional research or for actually prototyping an application. After our CIs, we were able to better refine our goal to data output. Specifically, reviewing records requires examining many different and disparate pieces of information to come to a meaningful conclusion and decide on an appropriate treatment. No electronic or paper charts today are designed around this idea, meaning there is an opportunity for interesting a novel approaches. 2. Thyvalikakath TP, Schleyer TK, Monaco V. Heuristic evaluation of clinical functions in four practice management systems: a pilot study. J Am Dent Assoc.Feb 2007;138(2): 209-10, 212-8. 3. Irwin JY, Torres-Urquidy MH, Monaco V, Schleyer TK. Workflow and information management during dental examinations and treatment planning. (in review).